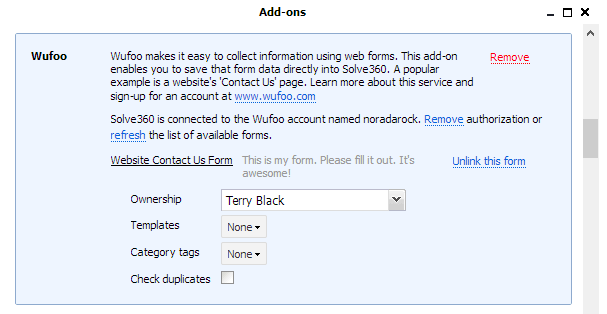 Wufoo is an online service that makes it easy to collect information via web forms. Solve previously provided just a “Wufoo API wrapper” that enabled basic integration with Wufoo. This is often used to integrate a website’s “contact us” form directly to Solve. This basic integration requires some manual configuration in Wufoo and does not support extended features such as duplicate detection and auto-insertion of templates. Clients love the Solve-Wufoo integration so we’ve jumped in with both feet and implemented a full integration. The new integration no longer requires manual configuration - the benefits of a tighter integration is realized with a few simple “clicks” directly from within Solve by following Solve menu > Add-ons. Solve will automatically map Wufoo fields having the same label as Solve fields. Within the Add-on panel users can select who owns the new contact, which category tag(s) are added, which template(s) are inserted and if duplicates should be checked (always create a new record or update a matching record).